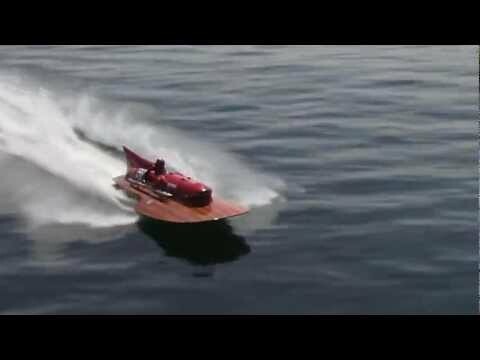 On October 15, 1953, this 6.2-meter three-point hydroplane racing hull with its 4,493.73 cc Ferrari Tipo 375 F1 V-12 engine topped the world speed record for its class at 150MPH (241.708 km/h.). It sold for nearly $1 million dollars at auction last year. If you like, you can buy a scaled-down replica for under $8,000. Russian animator Aeksandr Petrov and his son painted over 29,000 images over the course of two years to produce this pastels-on-glass animated adaptation of The Old Man and the Sea. In lieu of having to schedule a trip into port to pick up marines for defense, the HNLMS Johan de Witt can now execute paradrops in the middle of the high seas. Charlie Harry Francis and his company, Lick Me I’m Delicious, have succeeded in finding the sweet tooth’s response to the $300,000 test tube burger: A glow-in-the-dark ice cream synthesized from a jellyfish protein that causes luminescence when it reacts with calcium. Lu’ukai, meaning “sea diver” is a 6,000-meter capable ROV (remotely operated vehicle) designed by DOER Marine, owned and operated by the University of Hawai’i.